Aquagenic syringeal acrokeratoderma (ASA) is a rare condition that predominantly affects adolescent and young adult women.,, Over 30 cases of ASA have been reported until 2012. However, in a recent publication in 2015, Erturk-Ozdemir et al. presented a case series of ten patients, diagnosed with ASA over a short period of 13 months. Hence, we believe that this disorder has probably been underdiagnosed likely due to the nonlife-threatening clinical presentation of the lesions and its spontaneous resolution. ASA usually presents clinically as bilaterally symmetric pruritic palmar translucent white papules and plaques. Those lesions appear 2–10 min after exposure to water and last for 20–30 min. The soles are involved less frequently than the palms. The etiology of ASA is unknown, but several pathogenic mechanisms and associations have been proposed., We present the case of a patient with ASA of unknown etiology. 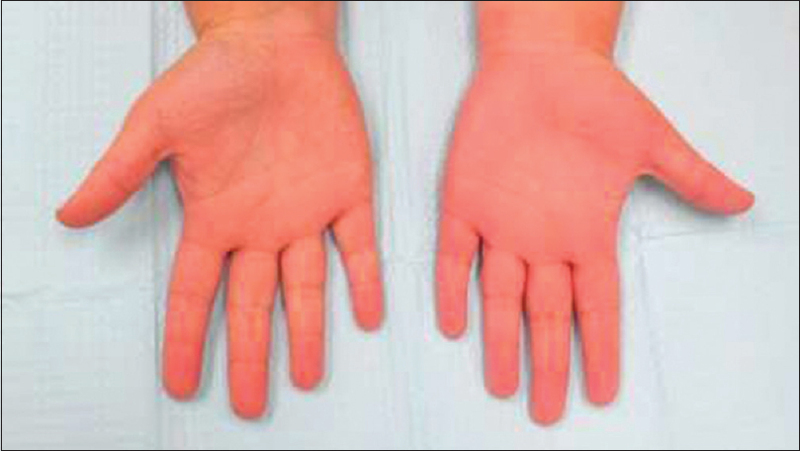 A 22-year-old Caucasian female presented with concerns of dryness, roughness, whitening, and hardening of her palms with handwashing or after showering. She stated that these changes to her palms are usually accompanied by a sensation of intense itch. She denied any known history of inherited disorders or medication use. She stated that she first noticed the unusual appearance of her palms approximately 5 years ago. On physical examination, white rugated plaques were noted on her bilateral palms 2 min after submersion in a basin of water in the office. It took about 30 min for these plaques to resolve after drying. A clinical diagnosis of ASA was made based on her history of worsening with immersion in water and by observation of the papules on the palms in the office after submersion in a water basin [Figure 1] and [Figure 2]. We advised her to apply 20% aluminum chloride to her palms nightly for 1 month. We recommended that her hands should be completely dry before applying the medication to avoid risk of irritation. After approximately 1 month, the patient returned for follow-up. She reported near-complete resolution of the white plaques and complete resolution of the associated pruritus. At that point, we advised her to slowly taper use until she would be able to successfully discontinue without recurrence. Photographs were re-taken for comparison to her hands pretreatment [Figure 3]. ASA is an uncommon acquired dermatologic disorder. The literature describes these patients as presenting with pitted, flat-topped, or translucent papules, with pebbly or white, prominent eccrine pores that are macerated in appearance and appear on the hands and feet. Due to the appearance of these papules with submersion in water, the disorder is popularly called the hand-in-the-bucket sign. ASA was described for the first time by English and McCollough in 1996 in two sisters. This rare disorder was named by the authors as transient reactive papulotranslucent acrokeratoderma, to emphasize the transient nature of the translucent papules shortly after immersion in water. ASA is different from the hereditary form, called hereditary papulotranslucent acrokeratoderma (HPA), which is characterized by persistent white papules on the palms and soles, hair abnormalities, and atopic diathesis. HPA is an autosomal dominant disorder and it was first reported in 1973 by Onwukwe et al. White papules occur in puberty and are concentrated on the margins of palms and soles. Lesions are usually persistent, and the appearance of papules is not associated with water exposure. ASA has been described under various names, including transient reactive papulotranslucent acrokeratoderma, aquagenic keratoderma, transient aquagenic palmar hyperwrinkling, and early aquagenic wrinkling. Although the exact etiology is unknown, ASA has many proposed causes. It has been reported to be induced by cyclooxygenase-2 (COX-2) inhibitors, such as rofecoxib and celecoxib. It has also been induced by other drugs including aspirin, acetaminophen, ascorbic acid, and clarithromycin. The proposed mechanism behind the pathogenesis of drug-induced ASA involves increased sodium retention in the epidermal keratinocytes and therefore increased capacity of water uptake in the stratum corneum. This mechanism is similar to that seen with renal side effects of COX-2 inhibitors. ASA has also been associated with hyperhidrosis, palmar erythema, allergic rhinitis, bronchial asthma, cystic fibrosis, and malignant melanoma. The pathogenesis of ASA remains unclear, but it may be a primary keratoderma or related to an acquired sweat gland abnormality since it has a strong association to cystic fibrosis. Several studies have found that it is present in about 40%–84% of cystic fibrosis patients and also in carriers., Improvement of the ASA lesions with sweat gland-suppressing treatment options such as botulinum toxin injection and topical aluminum chloride suggests an etiopathogenesis of aberration of eccrine sweat gland function. The diagnosis of ASA is mostly clinical, but histology and dermoscopy may also be useful. Histopathologically, two case reports on ASA noted clear cell change and vacuolization of epithelial cells. Other histologic findings include mild orthokeratotic hyperkeratosis and dilated eccrine ducts. On dermoscopy, marked enlargement of the sweat duct puncta is seen compared with those in unaffected palmar regions, reflecting the dilated and tortuous acrosyringium. Differential diagnosis for ASA is cutaneous disease associated with water contacts including xerosis, aquagenic urticaria, HPA, aquagenic pruritus, and aquadynia. ASA causes a burning and tightening sensation that may lead to a considerably impaired quality of life. Fortunately, the condition is characterized by a mild course and a good prognosis. Spontaneous resolution has been reported in four cases, and some cases have been found to clear after a few years.,, Treatment modalities available include aluminum chloride hexahydrate, urea with salicylic acid, or formalin in alcohol. In cases accompanied by hyperhidrosis, botulinum toxin injections proved to be effective. 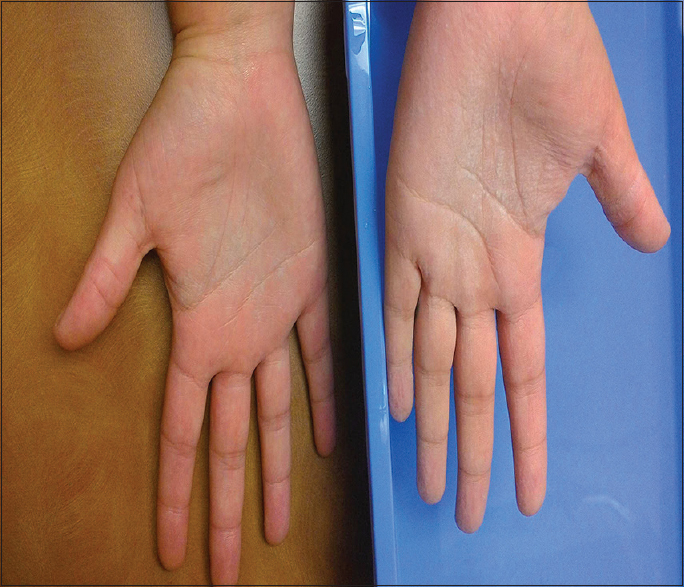 Endoscopic thoracic sympathectomy has been effectively used for long-term treatment in patients with ASA associated with severe palmar hyperhidrosis refractory to treatment. In data collected by Houle et al. in 2010, of 59 reported cases of ASA in the literature, four cases spontaneously resolved, four drug-related cases resolved with withdrawal, and the rest resolved or improved with treatment. There were seven cases which did not improve with treatment with aluminum-based therapy or antihistamine. However, it is very likely that the patients would have responded to treatment if more aggressive measures such as botulinum toxins, salicylic acid, or sympathectomy were employed. ASA remains a rare but interesting disorder with an etiology that is not completely understood. Our patient's history and physical examination did not suggest any known etiology. Our patient had no family history of cystic fibrosis or personal history of associated conditions or medication use. Genetic testing may be indicated in her case for cystic fibrosis or any other associated diseases. Pardo J, Sánchez-Motilla JM, Latasa JM. Atypical aquagenic keratoderma. Actas Dermosifiliogr 2005;96:540-2. Yan AC, Aasi SZ, Alms WJ, James WD, Heymann WR, Paller AS, et al. Aquagenic palmoplantar keratoderma. J Am Acad Dermatol 2001;44:696-9. Baldwin BT, Prakash A, Fenske NA, Messina JL. Aquagenic syringeal acrokeratoderma: Report of a case with histologic findings. J Am Acad Dermatol 2006;54:899-902. Ertürk-Özdemir E, Özcan D, Seçkin D. Acquired aquagenic syringeal acrokeratoderma: A case series of 10 patients. Australas J Dermatol 2015;56:e43-5. Flann S, Pembroke A. A localized form of aquagenic syringeal acrokeratoderma. Clin Exp Dermatol 2010;35:e147-8. Uyar B. Aquagenic syringeal acrokeratoderma. Indian J Dermatol 2014;59:632. Żychowska M, Batycka-Baran A, Szepietowski J, Baran W. Translucent whitish papules on the palms after exposure to the water – Aquagenic syringeal acrokeratoderma. Postepy Dermatol Alergol 2017;34:372-4. English JC 3rd, McCollough ML. Transient reactive papulotranslucent acrokeratoderma. J Am Acad Dermatol 1996;34:686-7. Angra D, Angra K, Rodney IJ. 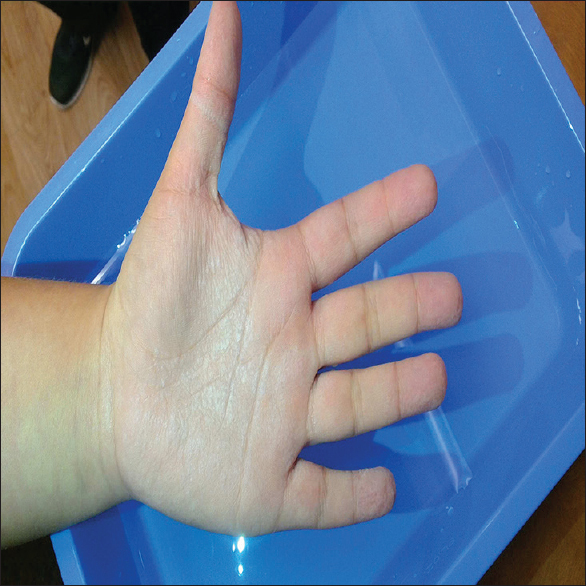 Aquagenic palmoplantar keratoderma with dorsal hand involvement in an adolescent female. JAAD Case Rep 2016;2:239-40. Akin Belli A, Dogan G. Role of cyclooxygenase inhibitors in aquagenic syringeal acrokeratoderma. J Eur Acad Dermatol Venereol 2016;30:e220-1. Dhawan AK, Bisherwal K, Gandhi V, Kawthekar P, Diwaker P. Aquagenic syringeal acrokeratoderma. Indian Dermatol Online J 2016;7:327-9. Falcón CS, Ortega SS. Aquagenic syringeal acrokeratoderma. J Am Acad Dermatol 2008;59:S112-3. Cabrol C, Bienvenu T, Ruaud L, Girodon E, Noacco G, Delobeau M, et al. Aquagenic palmoplantar keratoderma as a CFTR-related disorder. Acta Derm Venereol 2016;96:848-9. Sezer E, Durmaz EÖ, Çetin E, Şahin S. Permanent treatment of aquagenic syringeal acrokeratoderma with endoscopic thoracic sympathectomy. Indian J Dermatol Venereol Leprol 2015;81:648-50. Luo DQ, Li Y, Huang YB, Wu LC, He DY. Aquagenic syringeal acrokeratoderma in an adult man: Case report and review of the literature. Clin Exp Dermatol 2009;34:e907-9. Itin PH, Lautenschlager S. Aquagenic syringeal acrokeratoderma (transient reactive papulotranslucent acrokeratoderma). Dermatology 2002;204:8-11. Carder KR, Weston WL. Rofecoxib-induced instant aquagenic wrinkling of the palms. Pediatr Dermatol 2002;19:353-5. Bardazzi F, Savoia F, Dika E, Tabanelli M, Giacomini F. Acquired aquagenic keratoderma. Pediatr Dermatol 2007;24:197-8. Houle MC, Al Dhaybi R, Benohanian A. Unilateral aquagenic keratoderma treated with botulinum toxin A. J Dermatol Case Rep 2010;4:1-5.